Expand your brand awareness and engage your audience in most effective way by leveraging high impact advertising available on YouTube. Take advantage of reaching your audience on the most visited website in the world (after Google). Add another marketing channel into your mix in order to find new prospects that were not reachable through other channels. Be present where your prospects are throughout their entire buyer journey by running ads that appear on mobile, desktop, TV and more. Leverage video as a new and engaging way to tell your story and provoke action. #1 YOUTUBE IS THE #1 VIDEO SITE FOR INFLUENCING PURCHASE DECISIONS. Reach your prospects more efficiently with a custom YouTube advertising plan. Target the optimal audience for your business by using detailed criteria, such as demographics, interests, life events, and more. Promote your business by using different ad types, placements, and messaging that moves prospects through the buying journey and drives action at each step. Measure ROI with robust tracking and reporting of your campaign from ad impressions and clicks to visits and conversions. Leverage our team of YouTube specialists to set up and manage your YouTube marketing campaign that is in alignment with your business goals and objectives. 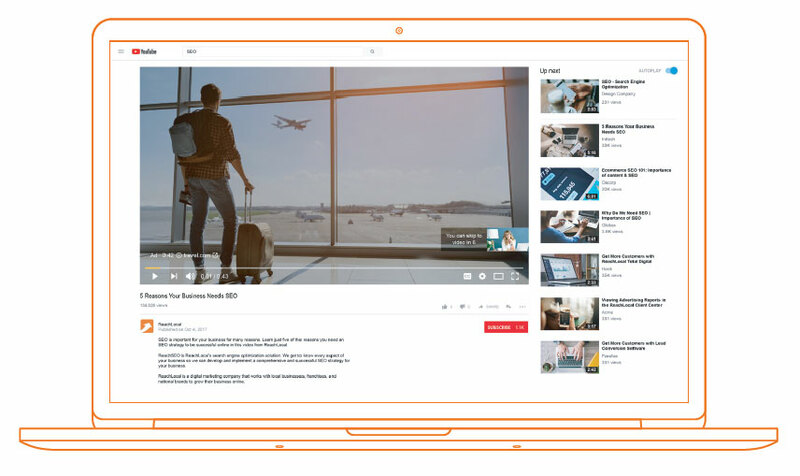 Run the most effective YouTube advertising strategy for your business that reaches your prospects and clients at each phase of their buying journey from awareness to interest to consideration. TrueView In-Stream AdsReach a broader audience with ads that play before a YouTube video. These ads are designed to capture the attention of your prospects within 5 seconds, and the ad placement is available at no charge until it plays for 30 seconds, plays in full or is clicked. Reporting and Performance ReviewsQuantify the effectiveness of each YouTube advertising campaign you launch with detailed performance reports. By reviewing your results on a regular basis, we can suggest ways to target your audience more efficiently. Additionally, we use Google’s safeguard tools to ensure that your ads do not appear on or around potentially offensive content. TrueView Discovery AdsEmploy discovery ads to reach your audience when they enter the interest stage of their buying journey. These ads appear as a thumbnail on the side of the video content being played, within the search results or on the YouTube mobile homepage and drive traffic to your site. Video Ad Production*Hire us to develop and produce your YouTube advertisements for you. We leverage best practices in video production that drive your prospects to engage with your brand and take action. Bumper AdsBuild brand awareness with short, 6-second ads that play before, during or after a YouTube video. These ads cannot be skipped and are therefore a great way to improve brand recall and ensure your message is delivered to the right audience. Google Brand Lift StudyHave Google conduct a brand lift study to quantify the impact of YouTube advertising on your brand. The study includes detailed performance metrics such as ad recall, brand awareness, consideration and intent to purchase.